I've looked at recipes for English muffin bread for years and never tried them…I don’t know why, because one of the only bread products I ever buy ready-made is English muffins. I don’t believe I will need to buy them anymore. This bread is great toasted, as most English muffins are. It’s so simple to make, it’s hard to believe, and it’s a great bread to try for those new to yeast breads. It doesn’t even have to rise in the bowl, just mix it, dump it in the pans, let it rise once, and bake it. The ingredients are inexpensive and most kitchens will have them on hand. I didn’t let my bread double – I let it rise to the top of the pan. With instant yeast, that only took 20 minutes, active dry yeast may take 45 minutes. Start preheating your oven when you start mixing this bread so it’ll be hot when the loaves are ready to go in. 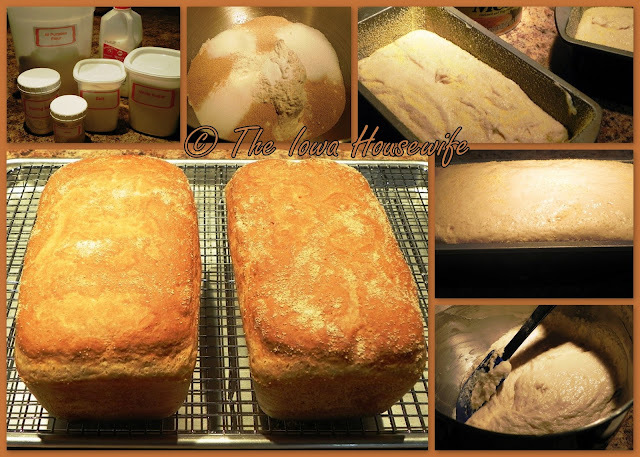 Check out Myrna's batter bread tips HERE. Grease two 8 1/2 x 4 1/2 x 2 1/2" loaf pans. Sprinkle pans with cornmeal. Spoon batter (1# 6 1/2 ounces each) into the pans and sprinkle cornmeal on top. Cover and let rise in warm place until doubled (20 - 45 minutes depending on what kind of yeast). Bake at 375° for 30-35 minutes or until golden brown. Remove from pans immediately and cool on wire racks. 2013 Cost: $1.56 per recipe or 78¢ per loaf or 5¢ per slice. "Taste of Home Complete Guide to Country Cooking"
Per Serving: 82 Calories; 1g Fat (7.8% calories from fat); 3g Protein; 16g Carbohydrate; 1g Dietary Fiber; 2mg Cholesterol; 151mg Sodium. Exchanges: 1 Grain (Starch); 0 Non-Fat Milk; 0 Fat; 0 Other Carbohydrates. I make English Muffin Bread all the time, but found the cornmeal doesn't really bring anything to the loaf, so I leave it out. I also switch out whole wheat flour for as much as half the all-purpose flour for a really, really nice loaf. My husband says that the half whole wheat version is his favorite. 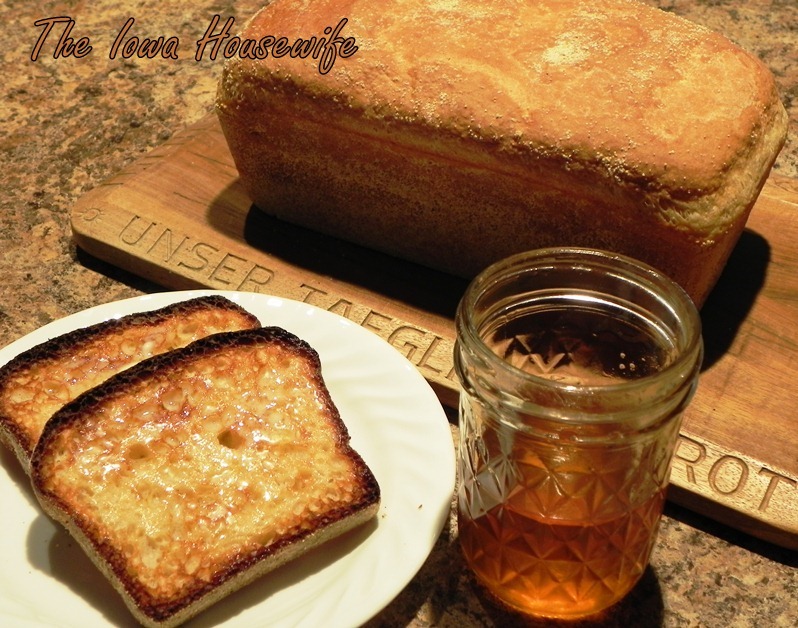 Sounds like we will have to try your whole wheat version...that is what I usually make for our "daily bread". Would medium grind (Bob's Red Mill) cornmeal work okay for this recipe? I have some left over from your "Make it Ahead Corn Bread." I don't see why not, you are just coating the pans with the cornmeal. Can this be made in a bread machine? I would make a half recipe for one loaf.